SSONTAL Tonalin® CLA 90 Softgel capsules for sensible weight management. Unless you follow a strict diet and exercise program you struggle to maintain your ideal weight. Stop the yo-yo effect. Take control your weight by using SONTAL Tonalin® CLA. You can reach your ideal weight without over-complicating your diet and workout regimen. Decrease the amount of fat your body stores. Maintain lean muscle mass by burning calories more efficiently. Prevent fat cells from refilling, so you remain toned and lean. Conjugated linoleic Acid reduces body fat in healthy, exercising humans. Research: Volunteers received either CLA or a placebo for three months, and were asked not to make any other changes in their diet and lifestyle for the duration of the study. Results: The CLA group had a significant reduction in body fat percent from 21.3% to 17.0%, and a modest reduction in body weight (from 153.1 lbs to 151.6 lbs). Conjugated linoleic Acid reduces abdominal fat in overweight adults. Research: Volunteers received either CLA or a placebo for four weeks, and did not make any other changes in their diet and lifestyle during the study. Results: The CLA group had a significant decrease in abdominal diameter, an average of one inch from their waistline. Conjugated linoleic acid supplementation for 1 year reduces body fat mass in healthy overweight humans. Research: Overweight volunteers received CLA each day over a one-year period; control group received a placebo each day. Results: At the study’s conclusion, average body fat mass in the CLA groups was 6.9% – 8.7% lower than that in the placebo-control group. Long-term supplementation with CLA was shown to reduce body fat mass in healthy, overweight adults. Conjugated Linoleic Acid for 24 months is very well tolerated by and reduces body fat mass in healthy overweight humans. Research: In a follow-up of a 12 month placebo-controlled study, moderately overweight volunteers received CLA each day. Results: Subjects who lost body fat mass in first year of the study maintained their body reduction, and subjects who previously had received placebo and were switched to CLA, then also showed significant reduction in body fat mass. Leptin levels decreased over the whole period of supplementation by more than 20%. Tonalin Conjugated linoleic Acid in milk reduces body fat mass significantly. Laso et al. : British Journal of Nutrition 2007. Getting the right amount of CLA in your diet is difficult. Beef and dairy foods were once a good source. However, during the past 30 years changes in how cattle are raised (grain fed vs. grass fed), combined with the trend toward low-fat dairy, have greatly reduced the amount of CLA we get through our normal diets. Today, the recommended daily dose of CLA is 3.0 grams, for maximum effectiveness. To achieve that level in your diet, you would have to consume more than 4 gallons of ice cream, seven pounds of beef, or almost 4 gallons of whole milk every day! Therefore, to retain effective amount of CLA, you need to take a dietary supplement or consume functional foods fortified with Tonalin® CLA. For maximum results you should take diet, health and fitness into consideration. Your fitness plan should include cardiovascular, weight training and stretching to strengthen and tone your body, along with balanced nutrition. Customize your fitness plan to your individual needs and interests. Be sure to consult your doctor before starting any new exercise program. 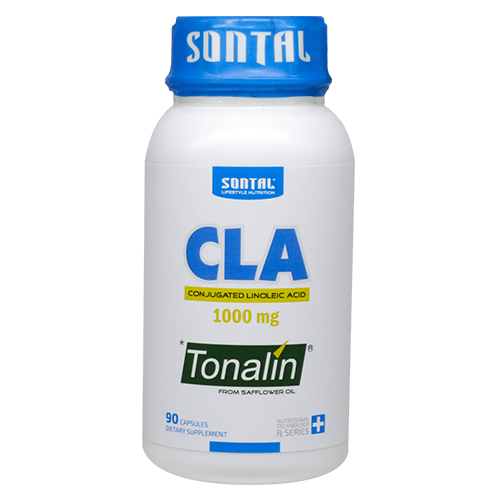 SONTAL Tonalin® CLA offers you safe, natural and effective body shaping. (S0) Not scheduled. Complementary Medicine. Tonalin Proprietary Blend 1000 mg. Derived from safflower Oil containing: Conjugated Linoleic Acid, Oleic Acid, Palmitic Acid, Stearic Acid, Linoleic Acid. Each 1000 mg softgel contains a minimum 75-82% CLA (providing at least 750 mg CLA per softgel). Other Ingredients: Gelatine, Glycerine, Tocopherols (Preservatives). The term conjugated linoleic acid (CLA) describes a group of conjugated, octadecadieonic acid isomers of linoleic acid.The two isomers with known biological activity are cis-9,trans-11 linoleic acid and trans-10,cis-12 linoleic acid, providing 50:50 ratios of the two isomers. Evidence suggests that the cis-9,trans-11 and trans-10,cis-12 isomers of CLA exert different effects within the body when taken individually and together. Beneficial body composition changes have been associated primarily with trans-10,cis-12 CLA in vitro and animal studies. In vitro and animal studies have also shown that trans-10,cis-12 CLA reduced adipocyte lipid filling, increased lipolysis, and decreased lipoprotein lipase activity. The mechanism of action has been well studied: if fat consumed is not used for energy, the triglycerides are taken up by fat cells – a mechanism for which the enzyme lipoprotein lipase is responsible. CLA inhibits this enzyme, and instead the triglycerides are diverted to the muscle cells to be burnt. Here the CLA induces the activity of another enzyme, carnitine palmitoyl transferase, which is responsible for oxidation and the burning of fat. CLA (conjugated linoleic acid) as a dietary supplement for CLA deficiency, may help promote a beneficial effect on the immune system, may increase energy during physical exercise. CLA is generally well tolerated. However, because of the potential effects of CLA on glucose regulation, patients with diabetes or cardiovascular disease should avoid CLA use. Diabetes; Supplementation of CLA should be avoided by people suffering from diabetes or by people at risk of developing insulin resistance. Use as recommended under dosage and directions for use. Do not exceed recommended dosages unless otherwise prescribed by your doctor. Do not use this product if you are allergic to any of the ingredients contained in this product. Consult your doctor for advice if you are using any medication or if you are suffering from any medical condition. Product contains bovine derived ingredients. CLA is not recommended to be used by pregnant or lactating woman. If you are pregnant or breastfeeding your baby, please consult your doctor, pharmacist or health care professional for advice before using any dietary supplement. As a dietary supplement adults should take one (1) softgel three times daily before meals or as directed by your doctor. Dietary supplements cannot replace your daily nutritional diet. CLA is generally well tolerated. Commonly reported adverse effects of CLA are gastrointestinal, including nausea, diarrhoea, dyspepsia, and loose stools. In cases of suspected over dosage or allergic reactions, withdrawal of the product is indicated and where necessary the treatment of such over dosage is symptomatic and supportive. Caramel coloured soft gelatine capsule with oblong shape containing 1000 mg plant oil. White labelled plastic tablet container containing 60 Soft gelatine capsules. White labelled plastic tablet container containing 90 Soft gelatine capsules. Store between 15°C -250 C in a cool dry place, Close container firmly and protect from heat, light & oxygen. Keep out of reach of children and uninformed individuals. The 1000mg proprietary blend contains an substance derived from safflower oil containing: Conjugated Linoleic Acid, also Oleic Acid, Palmitic Acid, Stearic Acid, Linoleic Acid. Other Ingredients: Gelatine (from Bovine), Glycerine, Tocopherols (Preservatives). Approved indication and use, that is, what this medicine is used for CLA (conjugated linoleic acid) as a dietary supplement for CLA deficiency, may help promote a beneficial effect on the immune system, may increase energy during physical exercise. Tonalin CLA is generally well tolerated at the recommended dose. If your stomach is sensitive to oil you may consider eating a healthy snack before you take the capsules. Have adequate water available to safely swallow the softgel capsule. We recommend to take a sip of water to wet the inside of your mouth before you put the softgel capsule in your mouth, the gelatine capsule has the tendency to stick to the inside of your mouth if your mouth is to dry. As recommended above you should preferably take CLA capsule directly before a meal, but in the case of not having 3 meals a day you may consider eating a healthy snack before you take the capsules. CLA is generally well tolerated. Commonly reported adverse effects of CLA are gastrointestinal, including nausea, diarrhoea, dyspepsia, and loose stools. Store between 15°C -250C in a cool dry place. Close container firmly and protect from heat, light & oxygen. Keep out of reach of children and uninformed individuals. It is recommended that you take any unused or expired CLA to your pharmacy for safe disposal. All pre-printed packaging are well branded and contain all the information on the label as required by law. Any additional information is contained in the package insert in the container or within the patient information leaflet. Sontal Tonalin CLA (Conjugated Linoleic Acid) is caramel coloured soft gelatine capsule with oblong shape containing 1000 mg plant oil. The colour could differ from batch to batch from a light golden colour to a darker caramel colour depending on the time since manufacturing and the ambient temperature. The product freshness and integrity will be the same for the different colour variations as longs as the product is being stored under the prescribed storage conditions.